As part of its philanthropic commitments through the Eva and Les Erdi Humanitarian Charitable Foundation, Hotel Urban Brisbane proudly supports Hummingbird House, Queenslands only childrens hospice. Beyond caring for children with life limiting conditions in their final weeks, Hummingbird house supports patients and their families through a range of options including access to short break stays, family wellbeing services, creative therapies and works to meet the needs of each individual child and their family. Hummingbird house allows “kids to be kids” despite their condition, and for families to connect and to create memories that live on. 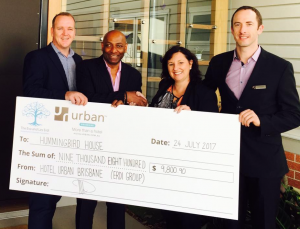 In a collaborative effort between the Eva and Les Erdi Humanitarian Charitable Foundation and Hotel Urban Brisbane, we were able to present Hummingbird House a donation of $9800 in July 2017 as part of our efforts to support the important work that Hummingbird House does to support families across Queensland and beyond.